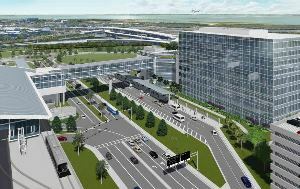 (December 6, 2018) The Hillsborough County Aviation Authority Board of Directors on December 6, approved a $66 million contract for construction of new facilities and site preparation of 35 acres at the Airport’s new SkyCenter development area. The approval, a major milestone in Tampa International Airport’s expansion, is the first vertical construction contract related to SkyCenter – one of the centerpieces of the second phase of the airport’s Master Plan, a three-phase capital program that will increase the airport’s capacity to 34 million annual passengers. Before construction of Master Plan Phase 1 began in November 2014, TPA had a maximum capacity of 23 million annual passengers. In fiscal year 2018, the Airport served 21 million passengers – an all-time record. The construction contract, awarded to Hensel Phelps Construction, enables the company to develop the SkyCenter site, which is located just west of Tampa International Airport’s new Rental Car Center. The company will also build a 40,000 square-foot atrium and 230-foot long pedestrian bridge that connects it to the SkyConnect station at the Rental Car Center, a new 650-foot commercial curbside, a 230-foot extension of the Rental Car Center’s remote curb that serves county buses, and reconfiguration of the Cell Phone Waiting Lot including new restrooms and Flight Information Display system. The Hensel Phelps contract includes a goal of spending 14.9 percent with woman- and minority-owned businesses – a key priority for the airport. Construction is expected to begin in January 2019. The site development and construction of the atrium and walkway are expected to be complete in 2020. Future plans for SkyCenter include a hotel, retail space and at least one office building. The Aviation Authority Board is scheduled to select a developer for a nine-story office building at SkyCenter next to the atrium early next year. TPA employees will occupy three stories in the building, allowing the Airport to demolish its offices next to the Main Terminal and make room for more passengers. In addition to SkyCenter, the second phase of the Master Plan includes adding express lanes to the airport’s Main Terminal pick-up and drop-off areas. Phase 1 of the Master Plan – a main terminal expansion, 1.4-mile people mover, new Rental Car Center and concessions overhaul – is largely complete. The third and final phase is a 16-gate airside.